Furnishings are items that are used to decorate Player Houses. They were first added with the Homestead update. 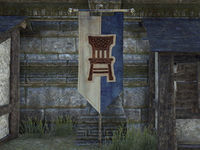 Many furnishings can be bought at Furnishers located in every zone, while others can be crafted using Furnishing Plans, and yet more can be bought with Crowns, both within bundles in the Crown Store or directly from the Housing Editor. For an unformatted raw table of all furnishings, see Furnishings/all. Antler Totem of the Reach This is a large house item. Bloodthorn Vines, Helix Bought from undaunted quartermaster This is a standard house item. Bloodthorn Vines, Large Bought from undaunted quartermaster This is a standard house item. Bloodthorn Vines, Massive Bought from undaunted quartermaster This is a large house item. Cat Statue This is a small house item. Clothier's Wheel This is a standard house item. Craglorn Orb This is a standard house item. Daedric Arena Tiles This is a standard house item. Daedric Pedestal This is a standard house item. Dragon Prayer Tile This is a small house item. Earthforge Hammer This is a standard house item. Fighters Curtains This is a standard house item. Fighters Pike This is a standard house item. Fighters Sign This is a standard house item. Fishing Spear This is a small house item. Funeral Garden This is a large house item. Grand Soul Gem This is a small house item. Grave Watcher This is a small house item. Great Soul Gem This is a small house item. Grinding Wheel This is a standard house item. Heron Statue This is a small house item. Hist Bloom This is a standard house item. Hist Blossom This is a standard house item. Hist Bud This is a standard house item. Lob's Display Horn This is a small house item. Maddening Knowledge This is a standard house item. Mages Sign This is a standard house item. Mages Tapestry This is a large house item. Nincrux Grinding Stone This is a standard house item. Nord Gravemarker This is a standard house item. Orc Prayer Tile This is a small house item. Outlaw's Standard This is a standard house item. Pay Day This is a tiny house item. Redguard Statue This is a small house item. Skull Prayer Tile This is a small house item. Soulgem Display This is a small house item. Standing Stone This is a large house item. Stonefalls Coral Fishing? This is a standard house item. Thin Statue Base This is a large house item. Woodworker's Saw This is a standard house item. Worm Cult Tapestry This is a standard house item. Yokudan Spears This is a standard house item. This page was last modified on 4 May 2018, at 20:45.